Share Outlook folders. Share tasks, notes and other items. 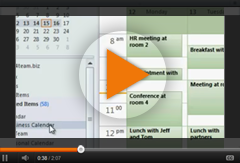 Sync and share Outlook .pst data, such as Outlook tasks, journal, notes etc. Synchronize and share Outlook items automatically or manually. Filters and advanced options will let you to exclude your private data (attachment, comments, etc.) from being shared. Share custom Outlook forms. Regardless of offline or online Outlook mode the items will be synchronized or shared automatically. Share different Outlook folders with various groups of people. Sharing Outlook .pst data, such as Tasks, Journal, Notes and other Outlook folders. Subscribe your contacts to receive automatic updates of shared Outlook folders. Manage subsribers list and user rights. Access shared Outlook folders located on your other computer. The person you are sharing Outlook folder with will receive an email invitation to save shared content and will be able to choose the destination folder. As soon as shared content is updated all changes are delivered by email. Thus you can share your Outlook from everywhere you can send email. It is a perfect tool to share Outlook folders from any place - corporate environment, home laptop or netbook.